The rain from Tuesday had pushed the river very high and cleared the debris of the last 11 months. I arrived at 8am just as the sun was rising. There was a very slight frost clinging onto vegetation in certain area’s of the fields but not enough to spoil the fishing I’m sure. On arriving at the swim things looked perfect. A friend Kevin had taken out a broken branch from the swim that hindered casting into the area that the barbel lived. It had broken off in some of the strong winds that we had recently. 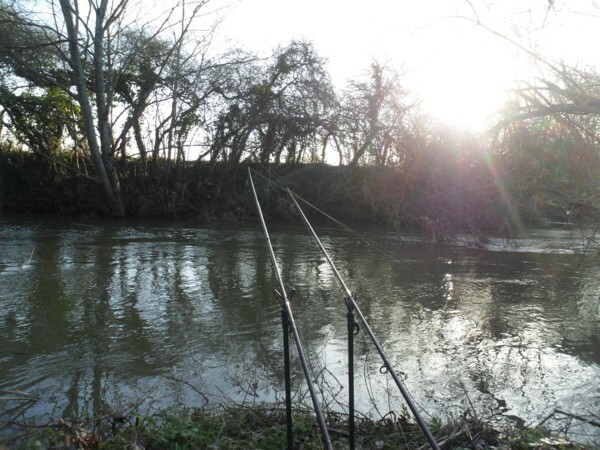 The river looked perfect as I cast my baits out into where I thought the barbel would be. The river here was a good steady run under some tree branches over a clear gravel bottom. The barbel normally hide under a snag slightly downstream during the summer and I was hoping I could get them moving up. As I sat back taking in the beautiful surroundings Kevin came into view. Along he came and now I could thank him personally for removing the branch from the swim. I put the reels in free spool and went up the bank to shake his hand and wish him Happy New Year. As I was doing this the rod top started to bounce around with a bite. With Kevin saying words of encouragement like you’ve got him I stuck into thin air. I recast again and carried on chatting. Kevin moved a little further upstream and fished a nice looking slack under some trailing branches. As I sat there thinking that the monster barbel can’t be far away. The few barbel present are of a really good size, but locating them might be the problem. As I sat there another friend arrived. 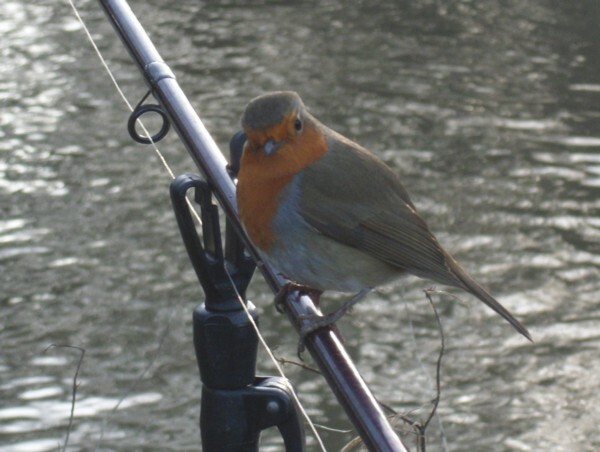 These anglers friends seem to find you where ever you are fishing. I crumbled a boilie that I was using and it ate some. What it really wanted though was some crumbs from my cheese rolls. So it enjoyed a few of these. Though when I wasn’t paying it much attention the robin would flap just around my head just to say that it was still there and could it have more food. Their greatest love though is maggots unfortunately I had none today, but hey ho it wasn’t going to starve. The day was passing by without anything much happening. Cloud started spreading from the southwest as forecast which warmed the air. Kevin hadn’t fair-ed any better than me, so he was off to pastures new to find some fish. The afternoon wore on and still nothing much came to investigate my bait. The robin though proved to be persistent. Another angler arrived to fish the swim and left disappointed after finding me there. Perhaps I should have left him to it and move on such was the inactivity from the swim. Then as the dark started to settle in I had one more rattle of the rod tip from the chub. As a friend said if we caught fish every time we fished it would be called “catching and not fishing”. This entry was posted on Sunday, January 8th, 2012 at 11:41 am	and is filed under Uncategorized. You can follow any responses to this entry through the RSS 2.0 feed. Both comments and pings are currently closed.